While typically a highly private person, Kate Middleton, aka the Duchess Cambridge, just opened up in a very personal way to students at the Lavender Primary School in London, England. During an exercise in which students brought in an object that makes them feel good, Kate joined in by revealing a memento that always brings a smile to her face. What was that memento? A picture from home! When it was her time to share, Kate pulled out a family photo (the same one used in their 2018 Christmas cards) of herself, Prince William and the royal couple’s three kids: Prince George, 5, Princess Charlotte, 3, and Prince Louis, 9 months. You guys, aww! Royals… they’re just like us? The Duchess of Cambridge was visiting local schools on Tuesday in support of Children’s Mental Health Week — which is run by Place2Be, a leading U.K. children’s mental health charity of which Kate serves as royal patron. Per Place2B’s website, a key aspect of Kate’s work with the charity is helping to address the importance of support for young people’s mental health at the earliest stage possible before problems can escalate. 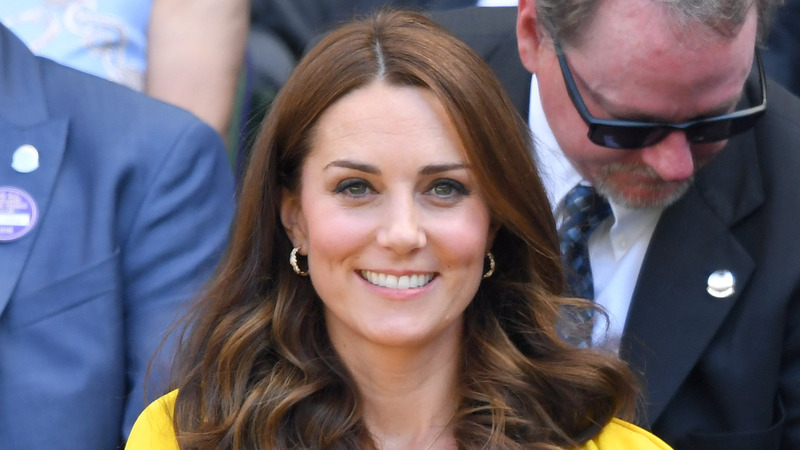 Kate has participated in Children’s Mental Health Week every year since its inception in 2015, with this year’s theme being “Healthy: Inside and Out” — the focus is the connection between mental and physical health. Prior to sharing her beloved family photo, Kate sat in on two lessons exemplifying the importance of mental health and watched kids do the Daily Mile challenge (which encourages mind- and mood-boosting activity). Kate has noticeably been putting mental health at the center of her public work as of late, forming a steering committee of academics and experts to help her pinpoint the best way to tackle prevalent issues. The motivation may be of personal significance to Kate, whose young brother, James Middleton, recently revealed his own battle with depression. He was inspired to do so, he wrote in an op-ed for the Daily Mail, by the mental health advocacy of Kate and the other royals. “They believe we can only tackle the stigma associated with mental illness if we have the courage to change the national conversation, to expel its negative associations,” he said.